San Luis Obispo, CA, August 24, 2017 –(PR.com)– This week, a mother in New Orleans took matters into her own hands in an effort to educate Family Court Judges on Cluster B personality disorders (antisocial, narcissistic and borderline personality). The mother who wishes to remain anonymous, hopes to capture the attention of local judges in New Orleans and surrounding areas. The billboard is located in a prime location directly across from the Superdome and the Smoothie King Center targeting the traffic into the Downtown New Orleans Business district and the Convention Center exits. 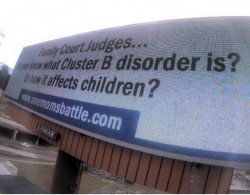 “I almost couldn’t believe it when she reached out to me and stated that she wanted to pay for a billboard to help educate her local judges on Cluster B personality disorders. This mother, like many parents around the world, are stuck in high-conflict custody battles and the common denominator is a Cluster B personality disordered individual. Sadly, even with a firm diagnosis of a Cluster B disorder, these individuals are often given custody simply because the courts do not understand the detrimental effects of this disorder on children. One Mom’s Battle is a grassroots movement and it takes a village to raise awareness so I am forever grateful to this mother for helping us to educate those in the court system.” – Tina Swithin, founder of One Mom’s Battle. What is a Cluster B Personality Disorder? The Diagnostic and Statistical Manual (DSM) is used by clinicians for the diagnosis of mental disorders. The Cluster B category contains four distinct personality disorders: Narcissistic Personality Disorder (NPD), Antisocial Personality Disorder (APD), Borderline Personality Disorder (BPD) and Histrionic Personality Disorder (HPD), however, HPD is not typically seen as part of the equation in high-conflict custody battles. With each of these three Cluster B disorders, there is a pronounced lack of empathy, repeated testing of laws, rules, and personal boundaries, much manipulation to meet their own needs which can fluctuate with their mood states, and sometimes fraud and other criminal activities. There is often high comorbidity with substance abuse and other forms of mental disorders. History: In 2011, One Mom’s Battle (OMB) began with one mother, Tina Swithin, navigating the choppy waters of a high-conflict divorce in the family court system while acting as her own attorney. Tina’s battle came to an end in 2014 when her ex-husband was stripped of all visits and contact with their children based largely on emotional abuse. Tina has since dedicated her life to assisting others who are following in her footsteps. OMB may have started with just one mom but it has turned into a grassroots movement reaching the far corners of the Earth. OMB is a primary resource for parents around the world and is helping to make systematic changes in the family court system through educational outreach. The team at OMB is gender inclusive, welcoming men just as much as women in their battles with Cluster B individuals. Our focus is firmly upon protecting children, not protecting mothers or fathers. While this began as one mother’s battle, it has turned into a village of education, love and support. The Investor’s Advocate: Are Ghosts of the Past Haunting Your Portfolio?